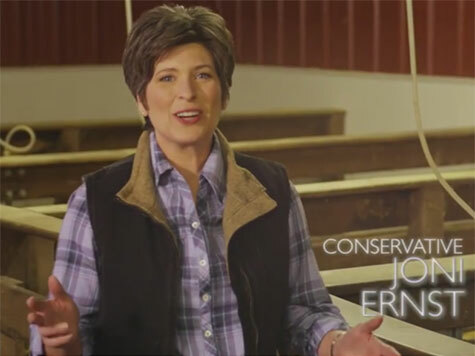 A new poll shows Republican Senate candidate Joni Ernst leading the Republican primary field in Iowa despite being outspent by her opponent 100-1 on television ads. The new Suffolk poll of likely voters in Iowa shows that Ernst now has 25 percent support while Jacobs is earning 22.77 percent. Forty percent of voters remain undecided. According to the Ernst campaign, the media buying firm Targeted Enterprises provided figures they are being outspent by Jacobs 100-1. Jacobs has spent $975,000 while Ernst has only spent $9,400. Ernst received the endorsements of both former Governor Mitt Romney, R-Mass., as well as former Governor Sarah Palin, R-Alaska. She also made waves after her hog castrating political ad went viral and was featured on the Tonight Show and the Colbert Report. The ad currently has nearly 500,000 views on YouTube.